Organization with style has never been so easy. This adjustable over-the-door hook rail has 3 hooks. This item can help you keep the clutter off your floors and counters. Adjustable feature allows for a range of 1 1/8 in.-2 in. Mirrored chrome wall bar for brilliant reflection. Suitable for damp locations. Perfect for bath, kitchen, and service porch areas. Halogen bulb(s) included with hardware and installation instructions. Organization with style has never been so easy. This wood rail with three metal hooks is designed to hold a wide variety of items coats, hats, handbags, umbrellas, towels or robes. This classic design is perfectly suited for any room from the entryway to the bathroom. From Liberty Hardware, this decorative Architectural Coat and Hat Hook Rack has 3 hooks to provide stylish organization. It's designed to hold a wide variety of items including coats, hats, handbags, umbrellas, towels and robes. It's an inspired way to add a touch of elegant storage where you need it most. 17 in. Lillington Adjustable Over-the-Door Hook Rail Chrome Organization with style has never been so easy. This adjustable over-the-door hook rail has 3 hooks. This item can help you keep the clutter off your floors and counters. 17 in. 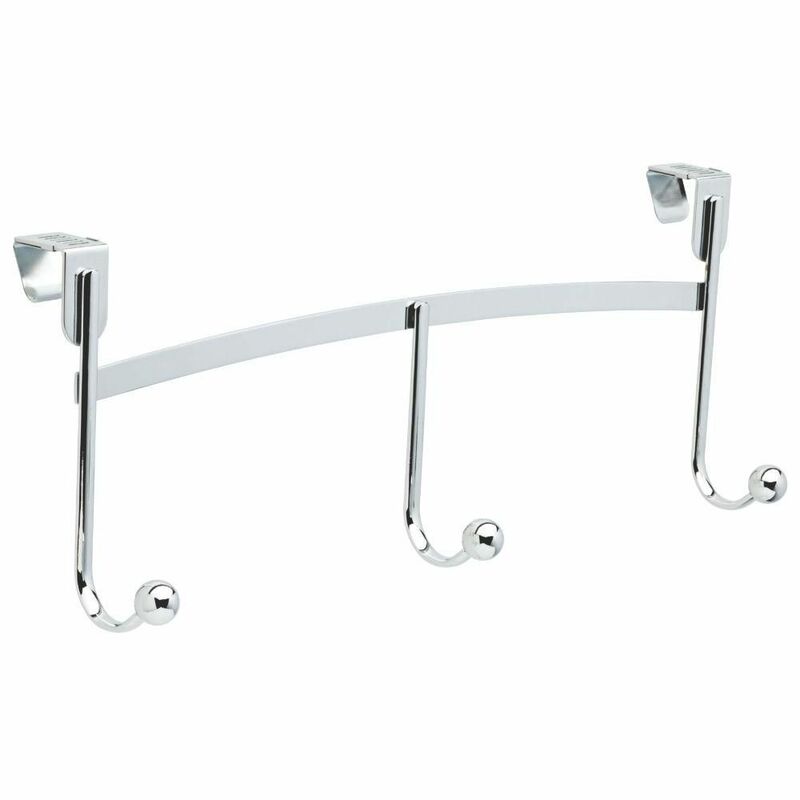 Lillington Adjustable Over-the-Door Hook Rail Chrome is rated 3.0 out of 5 by 14. Rated 1 out of 5 by Immirage from This is an utterly useless product. Do not purchase it. If I could give it zero stars, I would. t... This is an utterly useless product. Do not purchase it. If I could give it zero stars, I would. the "adjustable" tabs don't stay in place, so if you manage to get it hanging on your door, it will fall off as soon as you put any weight on it at all. It's a complete waste of money. Rated 5 out of 5 by Judith from Handy, non-permanent clothes handing solution. Living on the ocean,... Handy, non-permanent clothes handing solution. Living on the ocean, clothing need to be aired before storage and these hangers are a convenient, movable item. Rated 5 out of 5 by Timetamer from This coat rack is exactly what I was looking for! The wooden door to my office is much thicker t... This coat rack is exactly what I was looking for! The wooden door to my office is much thicker than a residential door - the adjustable hooks on this rack are perfect! Thank you. Rated 1 out of 5 by Linejudge from It is a bad design, the adjustable clip will not lock in place, so when you hang it on the door, ... It is a bad design, the adjustable clip will not lock in place, so when you hang it on the door, the two pieces fall off. Rated 5 out of 5 by Anieka from Good Purchase Nicer than another one I purchased at the same time.